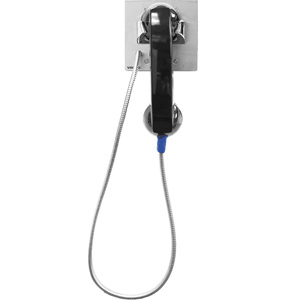 Vandal Resistant, Stainless Steel Panel Telephone consists of a heavy gauge stainless steel panel, an armored cable, a heavy duty, hearing aid compatible, amplified handset, and an all metal cradle. K-1500-6A works with Two-Way Phone Line Simulator Model #:DLE-200B) or on a dedicated ringdown circuit. If dialing is necessary, combine it with Hot Line Dialer (Model #:K-1900-5).